This recipe shows you how to make a delicious spicy and sour tom yum style soup using pork belly, whole shallots, morning glory leaves, and cherry tomatoes. We start by slowly cooking the pork in a rich herbal broth flavored with lemongrass, galangal, kiffir lime leaves, and hot chili until the layers of skin, fat, and meat are soft and juicy. 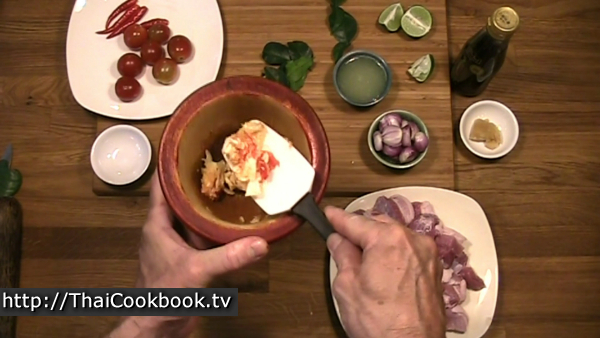 To round out the flavor we then add fresh squeezed lime juice and fish sauce, so the soup has a nice balance of spicy, salty, sour, and slightly sweet flavors. 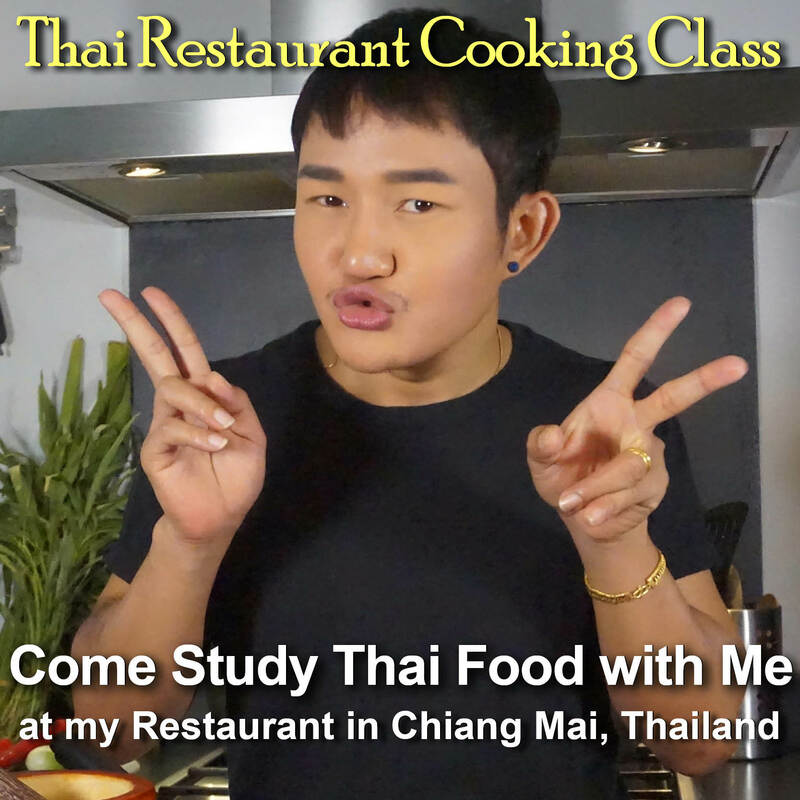 Because it requires at least an hour or more to prepare, you may not ever see Tum Yum Moo Saam Chan on the menu at your favorite Thai restaurant. Please give it a try and let us know what you think. 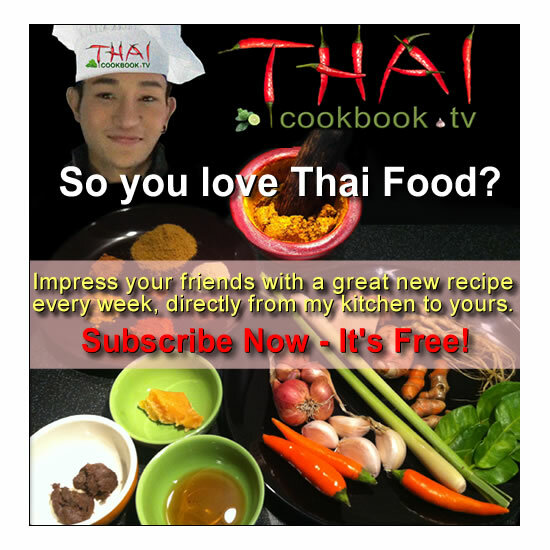 It's one or our favorite Thai soups. What's in our Spicy Pork Belly Soup. 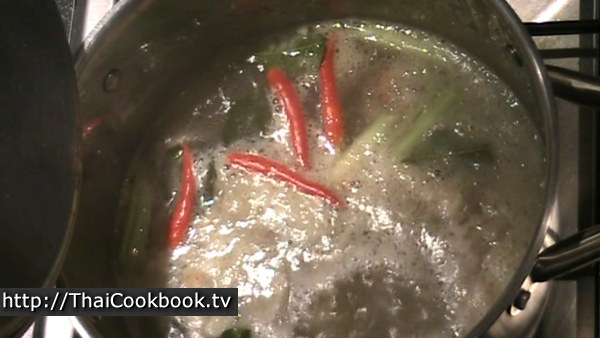 How we make our Spicy Pork Belly Soup. 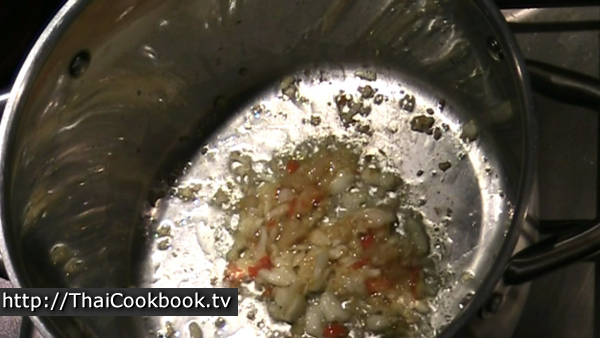 1) Grind the garlic and chili, then fry it in the bottom of your soup pan with a little oil. Add the coconut sugar and some water. Stir until the sugar melts and the water evaporates. Fry the pork belly in the herbs and sugar until well browned. 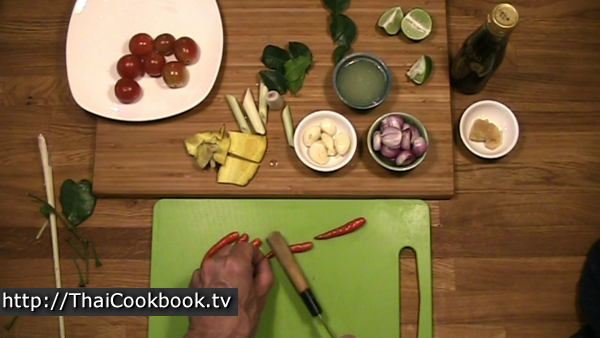 2) Add water, kaffir lime leaves, lemongrass, galangal, and chilies. Boil slowly, covered, for about 1 hour or until the pork belly is very soft. 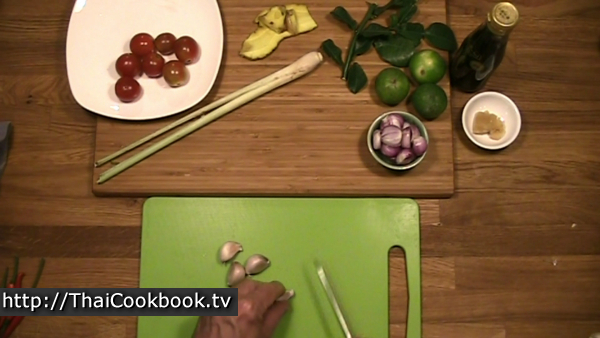 3) Season with lime juice and fish sauce. Add the whole shallots and continue cooking for 10 minutes. 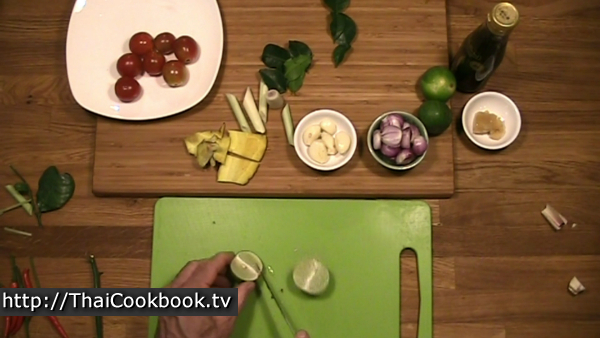 4) Add the morning glory plant and cherry tomatoes and cook for 5 minutes. 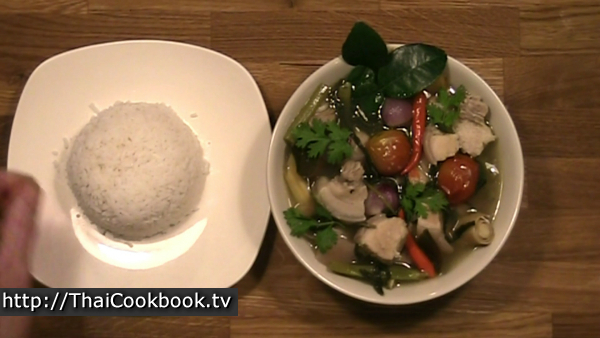 Serve in a large bowl, garnished with fresh kaffir lime leaves and cilantro, and with steamed rice on the side. Before you begin, organize the ingredients. Peel the small red shallots, leaving them whole as much as possible. Also clean and peel the garlic cloves. Hit the lemongrass stalk with your knife handle a little, just enough to crack it open, then cut the bottom portion into 3 - 4 smaller pieces. Cut the galangal slice into 2 - 3 one inch pieces. Select one or two nice kaffir lime leaves to use as a garnish and set them aside, then tear the center stems out of 3 - 4 of the other leaves so you have several small pieces of leaf to cook in the broth. Squeeze enough of the fresh lime so you have about 3 - 4 tablespoons of juice. Remove the green stems from the Thai hot chilies, then hit them with your knife handle lightly until they crack open a little, releasing the hot chili flavor. Cut the pork belly into 1 inch cubes. Grind the garlic and one of the hot chilies into a rough paste. Add one tablespoon of vegetable oil to a medium soup pot with a lid. Add the garlic and chili to the oil and fry for about 30 seconds over low heat. Add the coconut sugar and one tablespoon of water. Stir well and continue frying until the water evaporates and the sugar has melted. 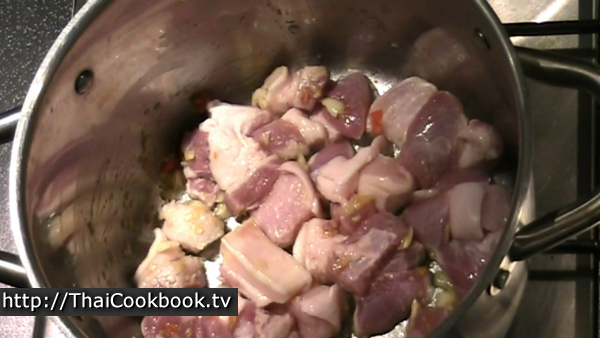 Add the pork belly to the garlic, chili, and sugar mixture and fry until well browned, stirring often. 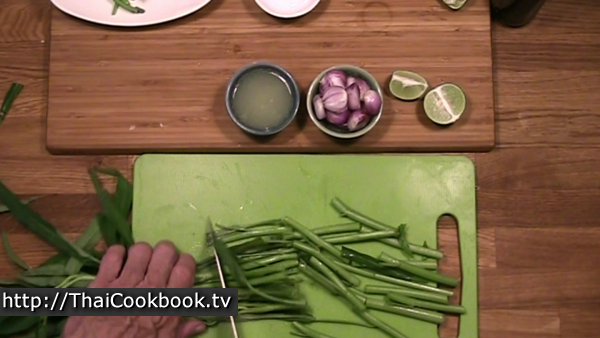 Add the water, lemongrass, galangal, kaffir lime leaf pieces, and chilies. Bring to a nice boil. Reduce the heat to a simmer, cover and cook the pork with the herbs for about an hour, stirring often and adding more water as need to maintain the same amount of broth. Cut the morning glory stalks into pieces about 4 - 6 inches long. After cooking for at least an hour, the pork belly should be nice and soft. You can continue cooking for more time if you think it needs it. When done, season the soup to your taste by adding about 3 tablespoons of lime juice and about 2 tablespoons of fish sauce. Stir it up well, then taste the broth. You want a nice balance of salty, sour, spicy, and slightly sweet flavors. 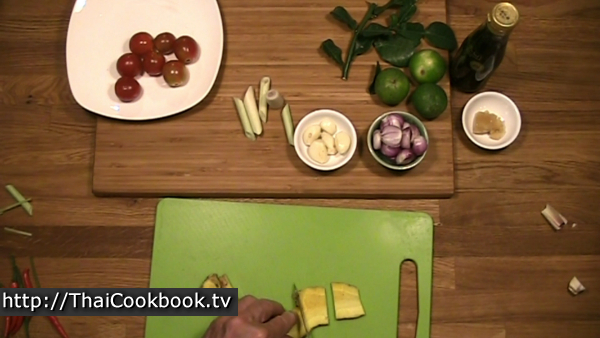 Add more lime for sour, and more fish sauce for salty until you are happy with the flavor of the broth. Add the while shallots and cook for about 10 more minutes. Add the morning glory and cherry tomatoes. Cook for about 5 minutes more, or until the tomatoes crack open a little. 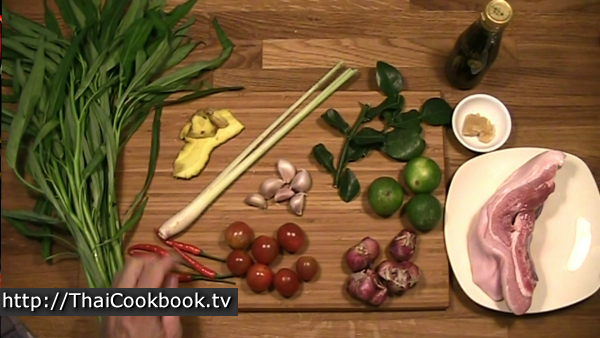 Serve in a big bowl to be shared at the table, Thailand style, or in individual bowls. 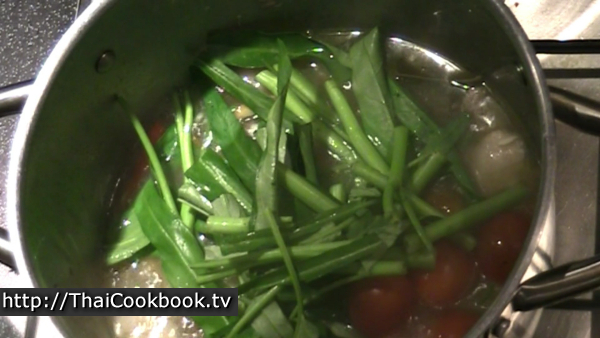 Arrange the ingredients so they look nice and are sticking out above the level of the broth. 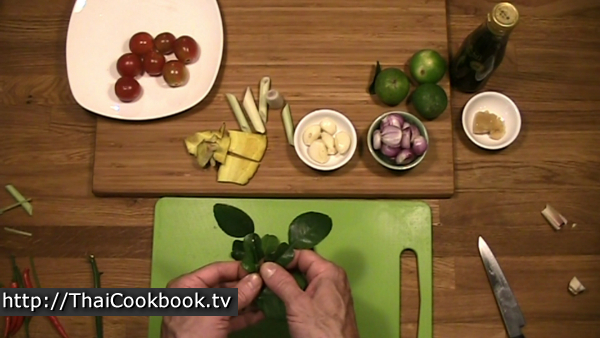 Garnish with some kaffir lime leaves and a few pieces of cilantro leaf or celery tops. Serve with steamed rice.